Scientists are usually a rather cheery bunch. But every now and then, they have a habit of wondering how the Universe might cave in and destroy us in the blink of an eye. Take physicists Frans Pretorius from Princeton University and William East from the Perimeter Institute for Theoretical Physics in Canada, for instance. They've come up with a new way we'll be snuffed out in a black hole. Superb! To be clear, we can file this into the 'very maybe probably not' category of potential apocalypse scenarios. So don't wave this study around as an excuse to avoid buying any Christmas cards this year. Still, if their calculations are solid, a collision between two types of gravitational waves of sufficient magnitude could create a special kind of black hole. And if that black hole was in our back yard, it could be a very bad day on planet Earth. Gravitational waves are a squeezing and stretching of the fabric of reality. This could be caused by an intense tugging on space-time by massive objects, such as neutron stars or black holes swinging around in an orbit before colliding in a cataclysmic release of energy. In those cases the wave spreads out like a bubble or ripple, growing as a sphere. Once the curvature of a ripple gets big enough, it can also appear fairly flat, like waves of parallel lines. Particles moving at light speed could also in theory create these 'plane fronted', parallel gravitational waves, at least according to Einstein's vacuum field theory. Physicists have wondered before what might happen if two of these flat wavefronts were to collide dead on. 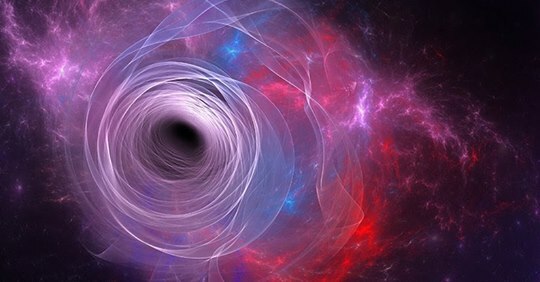 The consensus seems to be that the waves would focus space-time in such a way that a singularity is formed – the kind of singularity we'd expect at the core of a black hole. This isn't necessarily as bad as it sounds. Singularities are simple areas of physics where the usual rules don't hold thanks to some sort of off-the-chart scale, like an infinite curvature of space. They're not holes of doom. Well, not always. Normally any such merging of gravitational waves would occur without a problem, with the singularities dissipating quickly. Nonetheless, there are always those scientists who are curious to know if there are conditions where such outcomes are instead "pathological". Scientists like Pretorius and East. The two proposed a scenario where a point on a curving gravitational wave meets with a plane-fronted wave, and took into account of how the timing of the resulting collision might affect the singularity's evolution. Given enough energy, they suggest, space-time could wrap around the singularity, hiding it inside that familiar old devourer of stars, a black hole, which would absorb most of the wave's energy. The good news is that there isn't anything we know that could supply that amount of energy, especially in our corner of space. Even the recently detected gravitational waves spilling out from crashing black holes only managed to warp space on the scale of a proton by the time they reached Earth. For a black hole to form out of a meeting of gravitational waves, those waves would need to be much, much bigger. "You wouldn't want it to be nearby, and if it were it would stretch Earth by thousands of kilometers and everything would be destroyed," astrophysicist Vitor Cardoso from the University of Lisbon in Portugal explained to New Scientist's Leah Crane. "As soon as we learned about it, we would die." In 2010, Pretorius showed how collisions between particles at sufficiently high energies could also create plane-front waves that risked creating black holes, adding to other proposed mechanisms for home-grown black holes on Earth. While it's tempting to think physicists have a macabre interest in hypothetical destruction, this work has serious implications for cosmic theories involving space-time and matter distribution. The research has been put up on the pre peer review website arXiv.org to be picked apart by the physics community. So while we're awaiting independent validation, we can all read it and ponder our fate. Not that we have anything to worry about. Probably.